Equality of opportunity for everyone is essential for businesses to thrive. 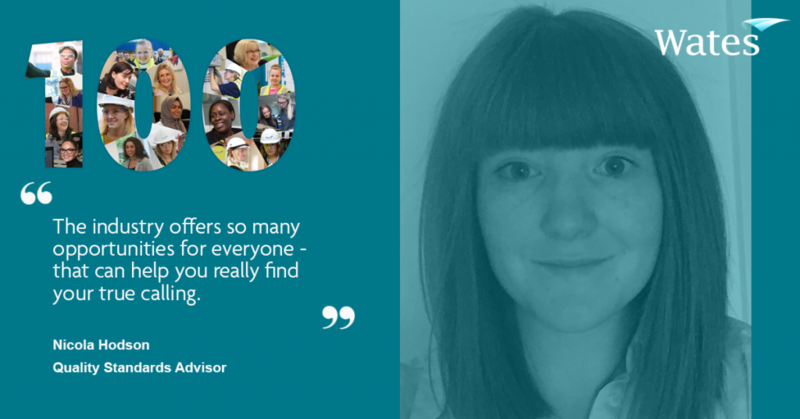 For 2019 International Woman’s Day, Nicola Hodson shares what #balanceforbetter means to her. I started my current role January 2019 however been with Wates now for 2 and half years, starting as a Production Management Trainee. What brought you to Wates? I used to work in architecture, however when deciding that wasn’t for me, I wanted a job with more hands on experience. The Wates Early Careers scheme was a perfect way of me joining the construction industry with a degree and figure out where I wanted my career to go. What attracted me to Wates in particular was the values of the business and its dedication to making a difference in the industry. The whole business evolves around people and being a people person myself, I thought it would be a perfect match. What advice would you give to women entering the industry? Don’t think too much about and just give it a try. It may not be the first choice of careers or your first career, but the industry offers so many opportunities for everyone and I think can really help you really find your true calling. Also come in with the attitude you are no different to your male colleagues, and they won’t treat you any differently; that’s always been my motto. In the business I have to say it is Helen Bunch. The fact she is a managing director for one of the fastest, ever changing divisions of Wates, Smartspace, is impressive on its own, but the fact she makes an effort to get to know her staff and colleagues, and knows how to get the best out of teams is inspiring. Outside Wates, I think it has to be Michelle Obama. She never asked to be First Lady but she stepped up to the role with such elegance, passion and drive, without making a big fuss about her own achievements. I like to be creative in my spare time; including upcycling furniture, sewing, knitting, sketching etc. What changes would you like to see in 100 years time? I hope in a 100 years time, we won’t be talking about diversity in construction as it won’t be a thing, and we will have a diverse workforce. But I also hope that the construction industry will still be very much about people. The people I meet on site are the glue in our industry, and although I would like to see construction using technology more, I don’t think there is anything better than something crafted by people and the pride they have once they have finished it and handed to a client. I just hope in 100 years, they aren’t getting hurt or hurting our environment. Read more from the women at Wates.